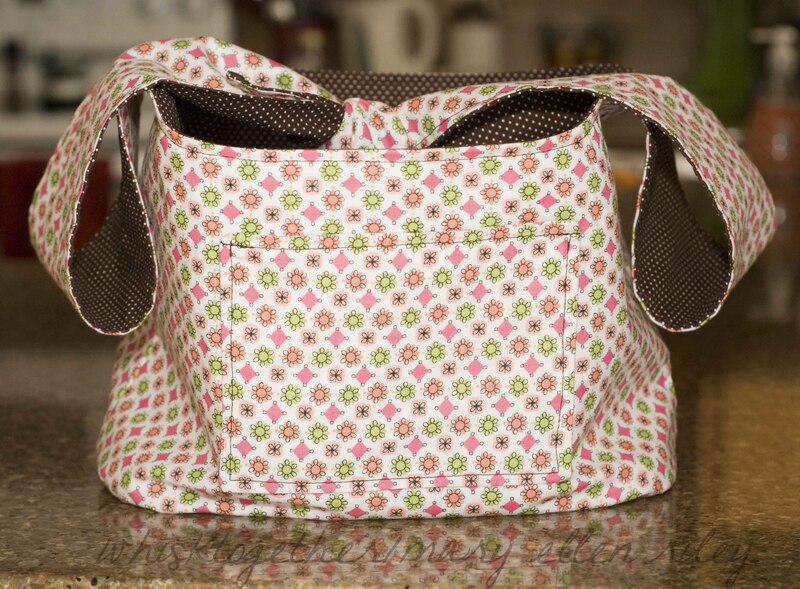 I had this inside-out reversible bag bookmarked for a long time, and I finally had the time after Christmas to make it after seeing it in the Thirty One Gifts catalog for $40 (It is larger in their catalog I think). 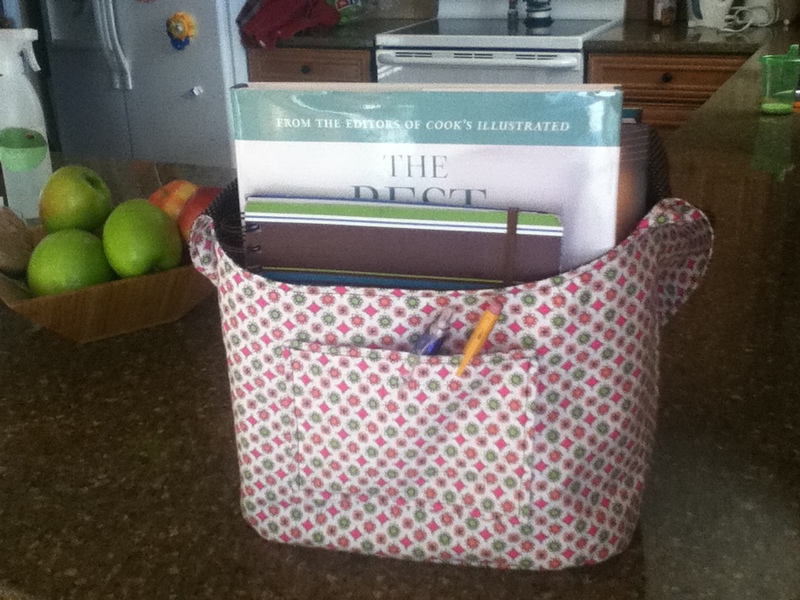 Use it for books, a small diaper bag, a place to stash your accessories, or carrying some snacks. Have fun! If you want a larger bag, then I would take the pattern pieces to a photocopier and increase them by 10% or 25% or however large you want to make the bag. And of course purchase your fabric accordingly. I needed only 1.5 yards total for this project. You may not need to increase the size of the strap though. That is up to you. 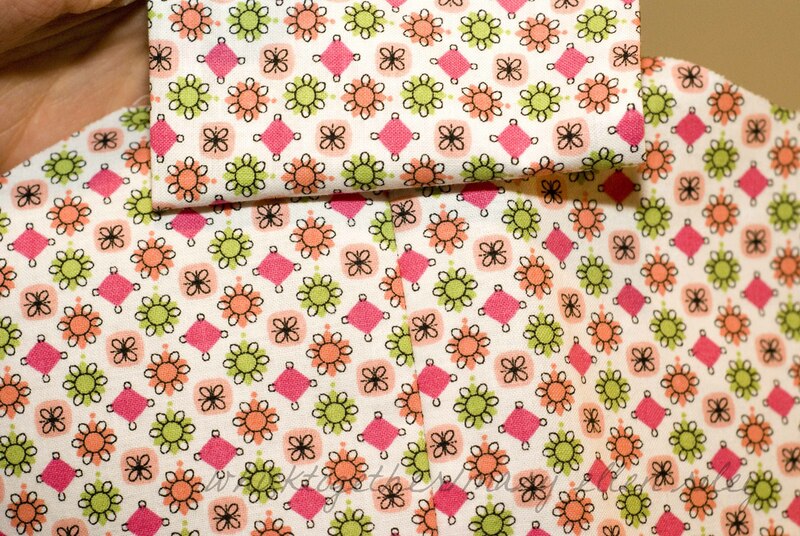 Fabric choices: I would suggest one pretty main fabric that you really love. After you have decided on that fabric, match it with a complimentary color that is also more subdued in pattern. Or, pull a color out of the main fabric to use as the “liner” fabric. You don’t have to, but you could use a busy main pattern, and then one that is plain and complimentary. Here, I used a pretty white and pink fabric as my main piece. 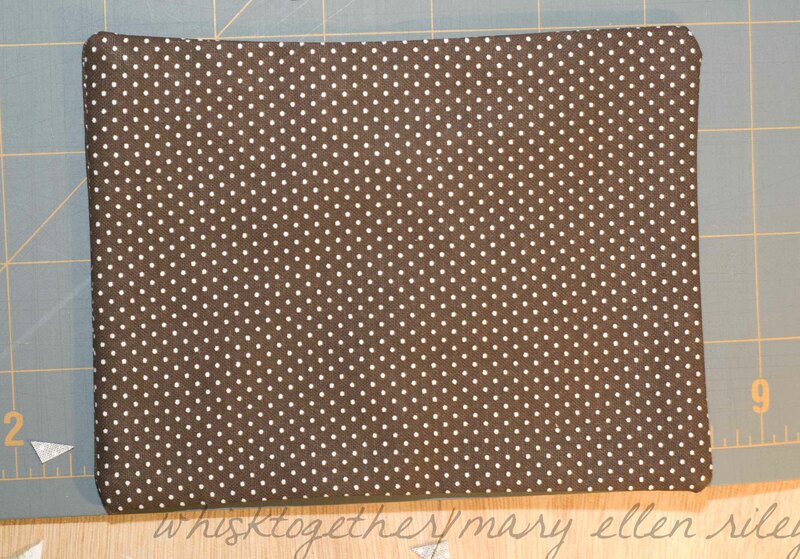 I had some plain brown with white polka dots in my stash, so that is what I used. The dark brown also works since that is a color in the main fabric. Finished product is 7″ high, 10″ wide and 6″ deep. 1. 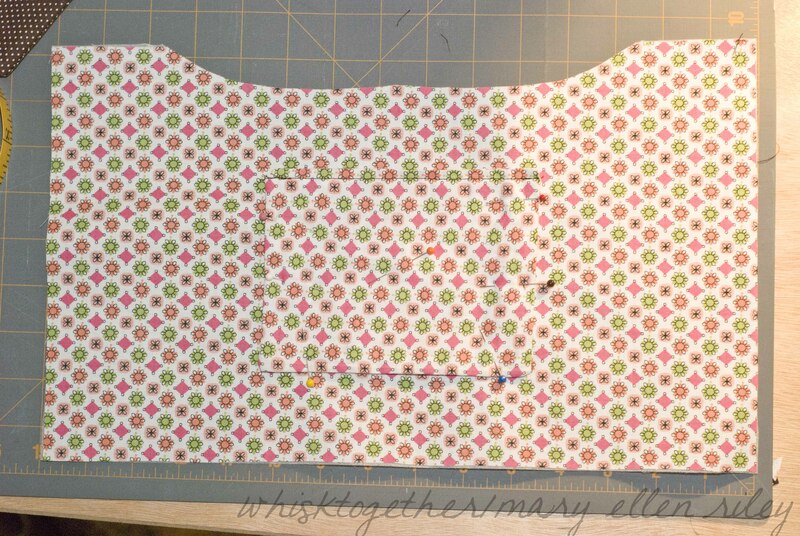 Print and cut out the pattern pieces. 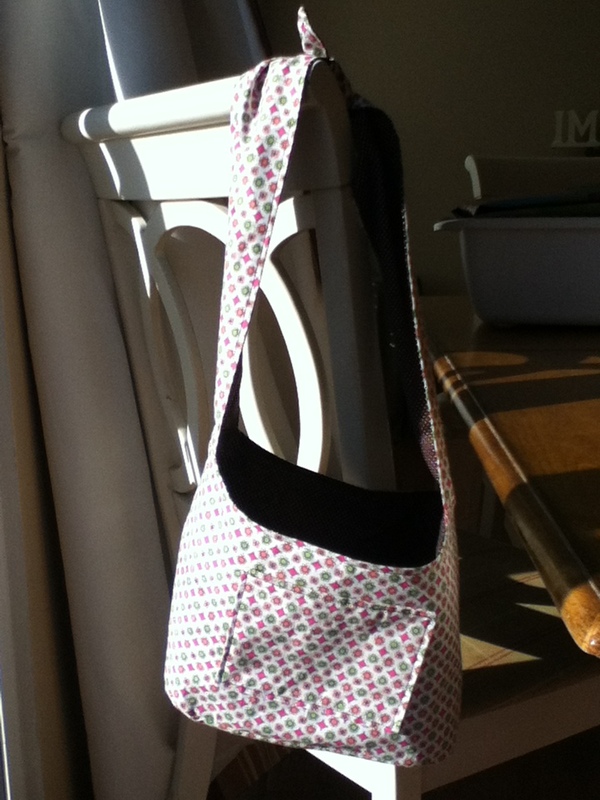 Tape the strap pattern together and the side bag pattern together. 2 pockets of liner fabric. 3. Iron the interfacing pieces to the main fabric. So, 2 bag sides and 1 bottom will be ironed to the 2 bag sides of the main fabric and 1 bottom of the main fabric. 4. First, we will make the pockets. 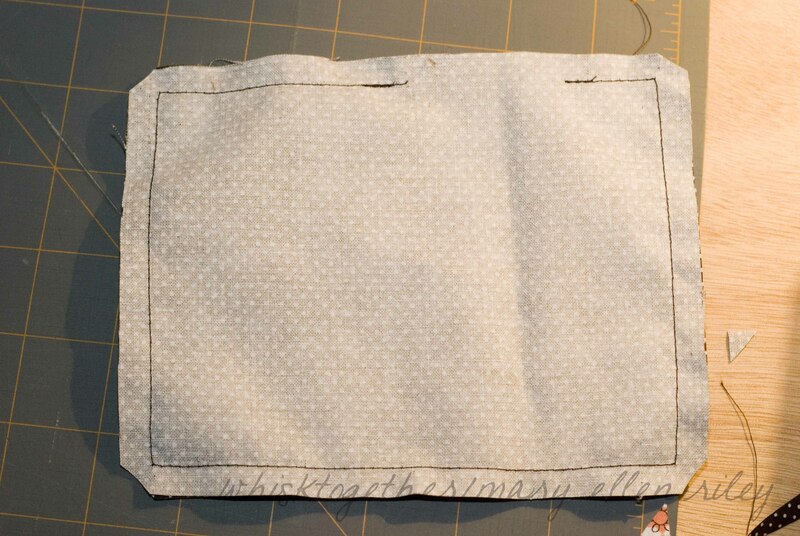 Put right sides together on each pocket. Sew all the way around EXCEPT for a small hole at the bottom (one of the long sides). About 1-1.5″ should work. 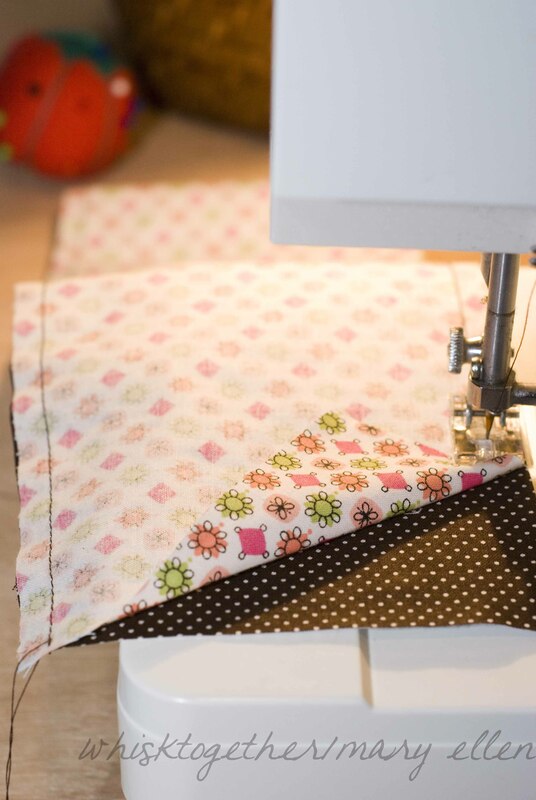 Remember to backstitch when starting and ending so that the threads do not come apart when turning the fabric. 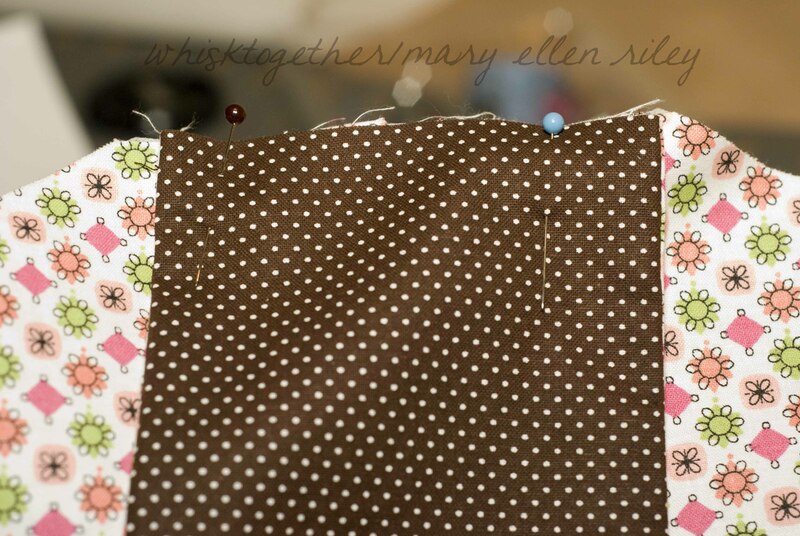 Once you sew all the way around except for the hole, clip the corner a little bit. 5. Turn the pocket and it will be right side out. I use a pencil or something to push the corners out nice and neat. Press the pocket and make sure to press the seam closed where you had the hole. 6. Find the long side of the pocket without the hold. Top stitch this long side. 7. 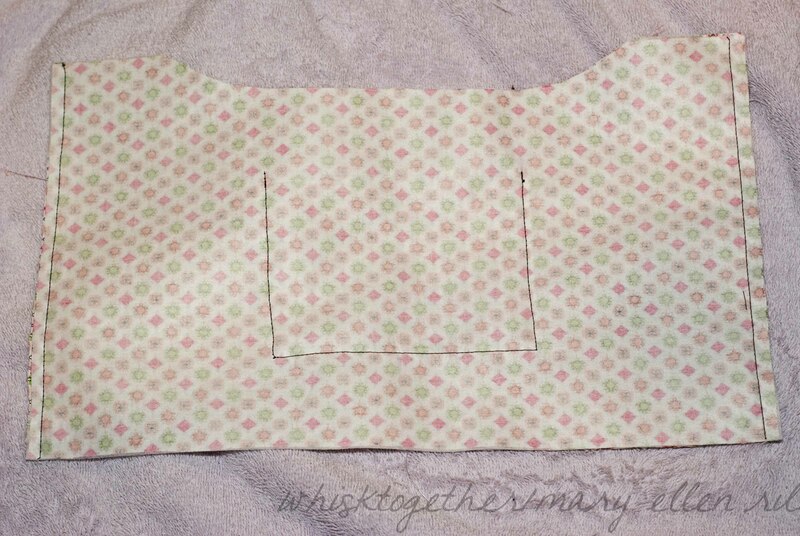 Pin the pocket to the middle of the side piece. 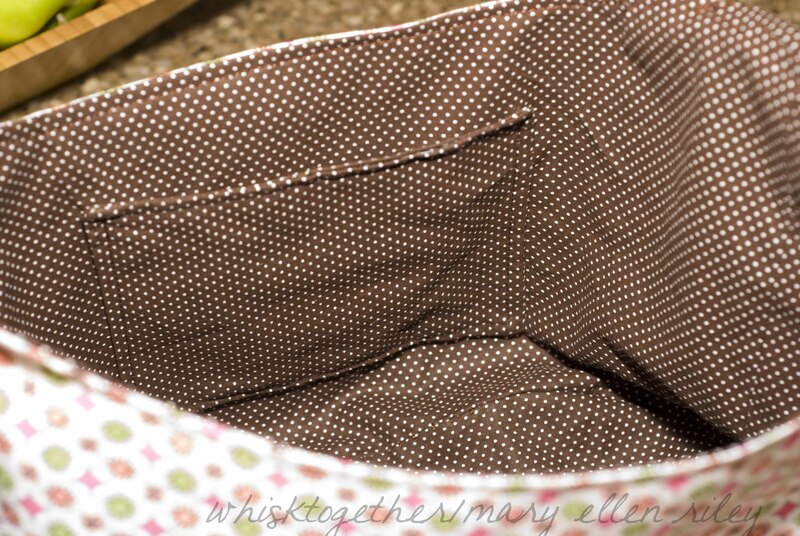 Sew the bottom and sides of the pocket to the bag side. 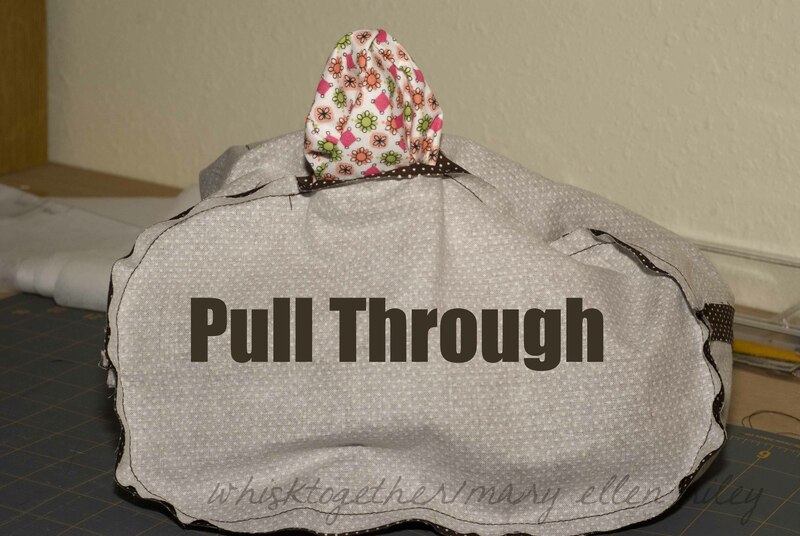 Make sure to keep an eye on the hole at the bottom and sew that closed while doing this. 9. Now, we’ll work on the bottom. My bag already had center marks from folding the fabric and cutting it out. If your bag sides do not, then fold the bag and mark the center of the sides. Now, you need the center points of the bottom piece. Take the bottom and fold it in half lengthwise and mark the center points. Take the bottom and fold it in half shortside, and mark the center points. 10. 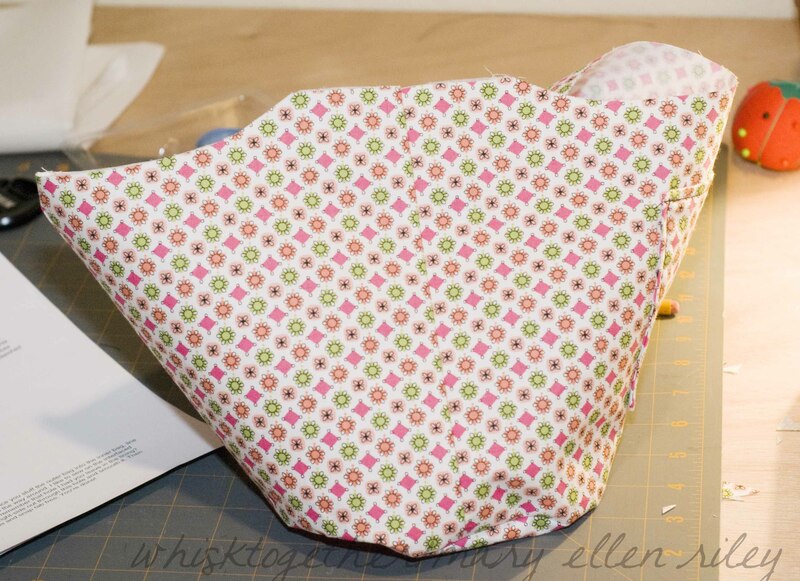 Working with the main fabric: Pin the bottom piece to the bottom of the bag, right sides together. 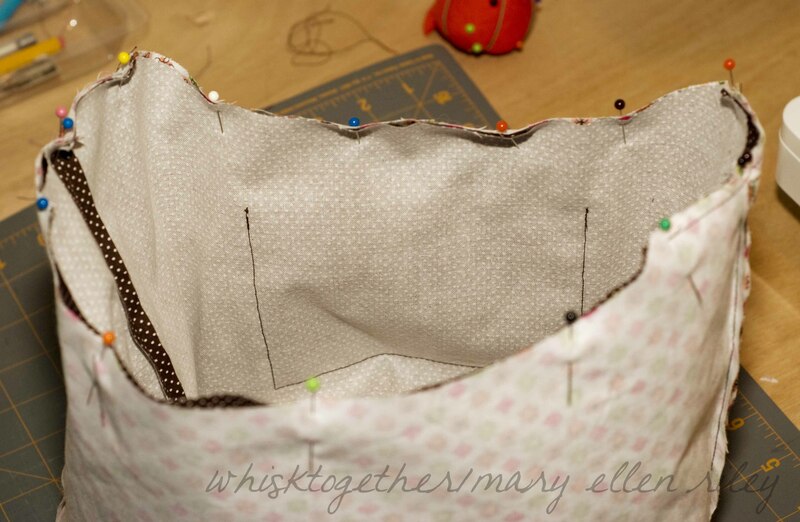 Line up the shortside center points with the seams on the bag’s side. Line of the longside center points of the bottom piece with the center of the bag (either from the fold or from marking them earlier). Sew the bottom piece on. 11. 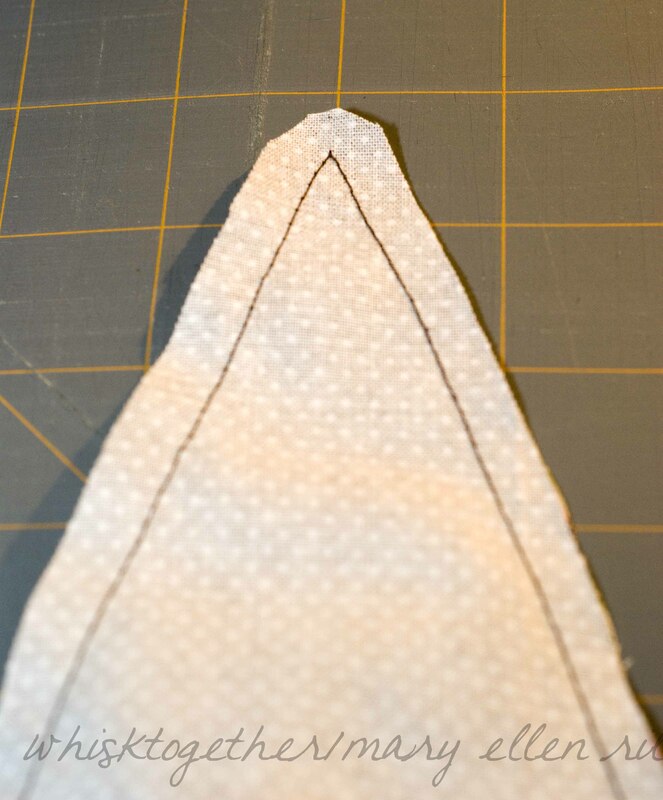 Follow the same steps in step 10 with the liner fabric. However, leave a 2-3″ hole along the bottom. Make sure to backstitch of course when beginning and ending. 12. 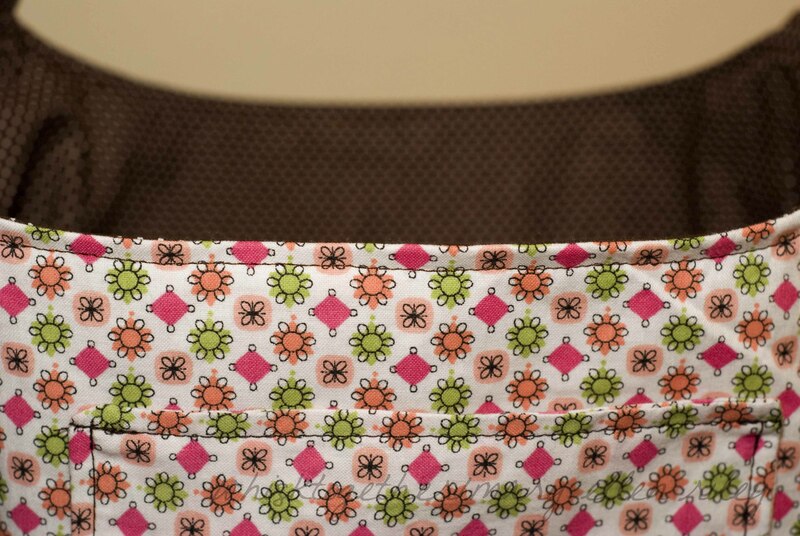 To make the straps: Take 1 main fabric and 1 liner fabric and pin them right sides together. Do the same with the other 2 pieces. Sew all the way around except the bottom/small straight edge. 13. Clip the point at the top and clip the corners. Turn it right-side out. Iron it. Top stitch. 14. Now, pin the strap to the side of the bag. There is a straight edge where your seam line is and that is where the strap goes. 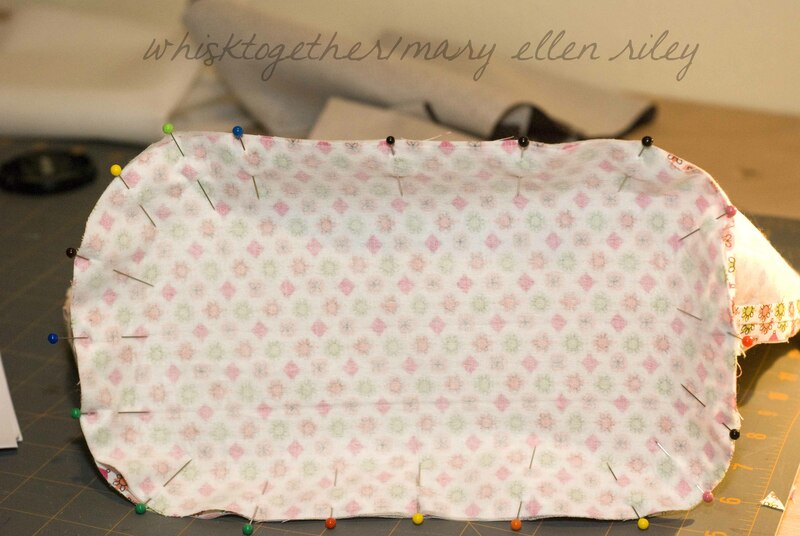 Make sure when pinning it to pin it so that the same fabric faces the same fabric. 16. 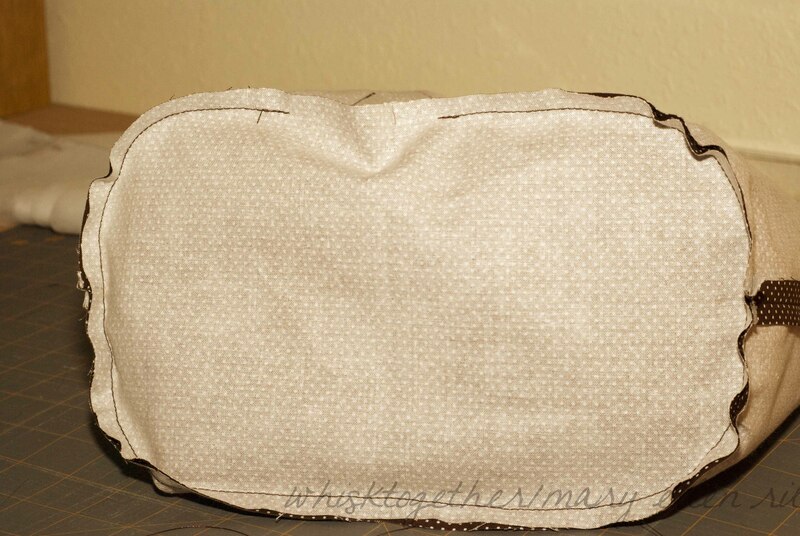 Place the main bag inside the liner bag right sides together. Stuff the straps inside the bag. I folded them inside a few times to make sure they didn’t accidentally get caught. Note, I also had to make sure that the liner bag. 17. After stuffing the bag inside the other bag, line up the edges together and pin them. Sew together. 18. Take the hole that you left in the bottom of the bag and pull the bag right-side out through that hole. 19. Top stitch the top of the bag – just watch your straps. I took part of my sewing machine off which made this step easier. 20. Blind stitch the hole closed that you pulled the fabric through in step 18 with thread that is close to the color of the fabric. 20. Feel free to add some flair like flowers! Pattern and idea adapted from Warehouse Fabrics, Inc. 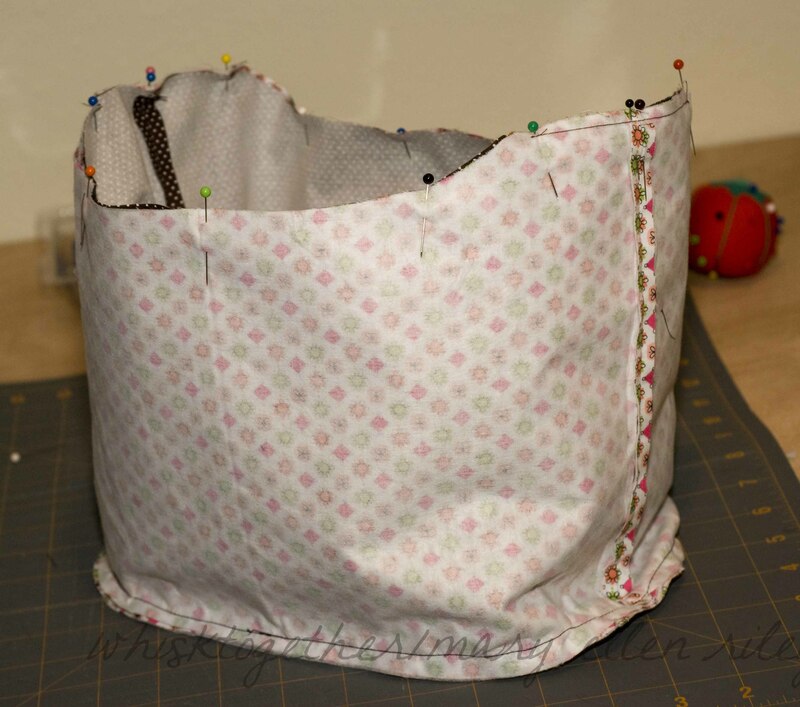 I wish I could sew; what a cool bag…. This looks like such a great bag!! Thanks for the pattern! Me too!!! I wish I knew how sew. I would have loved to make this. Do you sell them??? As of right now, no. But that could probably be arranged…. I have had an idea of doing a shop for ages since I started making crayon rolls. What are the dimensions for this? I might use it for library books. Great tutorial! I use it for my library books all the time! Great for keeping a few novels around with my card in the pocket. Thanks for the lovely comment. Have a GREAT day!! Crayon roll pattern available anywhere? Might be too complicated for quick sew me. I love this bag. Thank you so much for the pattern. It will stretch my patience, hmm sewing ability, hmm patience. I like 2 minute projects, this will take me hours but the results will be so worth it. Yes. If you see the tabs at the top of my home page, one is called “crafts” and will list my crafts including the crayon roll. 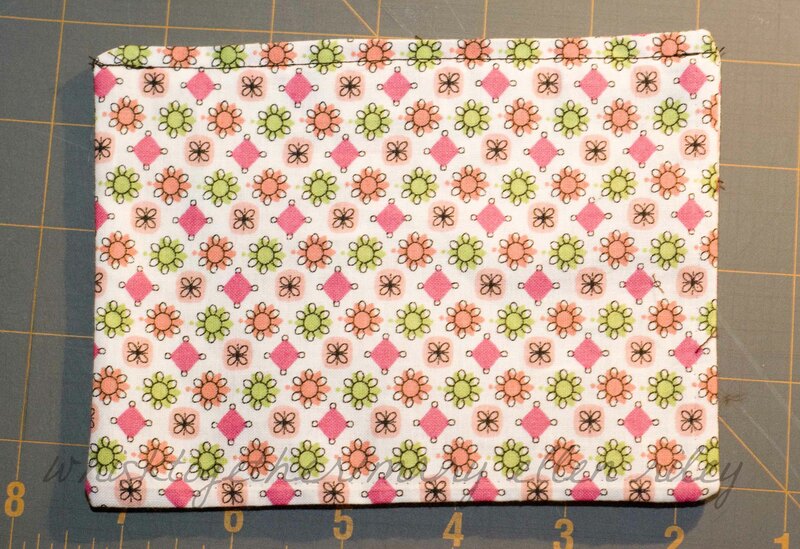 The crayon roll just requires basic stitching and top stitching. Great gift ideas! Perfect library bag! Love it!!! Thanks! I just finished 2. 1 denim, works fine without inner facing and a solid black and pink that is quilted. I shortened the straps and just made 1 strap. The black and pink one has a zippered pocket. Now both my daughters have one. Thank you. Cool! Thanks for the info on using denim! Lovely litlle carry all! I will need to make one. Thanks for sharing. Wow, so creative! I would love for you to come link up to my Get Social Sunday party and follow along. What a great idea for others to see! This is amazing! I love it and I love how to showed to do it. I am not good at sewing & need all the help I can get! I will be back. 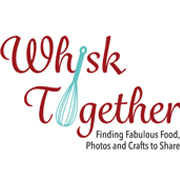 I am visiting today from Mop It Up Mondays Blog hop! Thanks so much for sharing the pattern. I have a couple of questions. #1. When I click on the patterns & the file opens up, is that the actual pattern (true to size)? 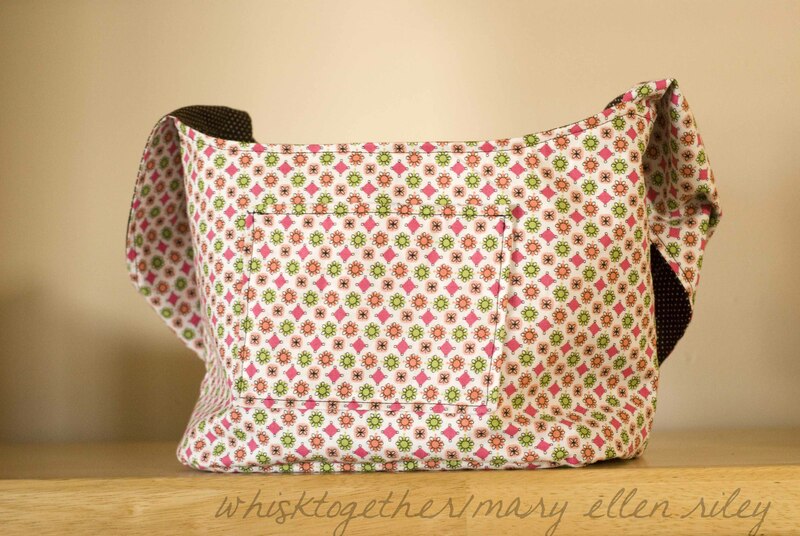 Can I print & pin the pattern right on the fabric & it will be the size of your bag? #2. I am a bit confused about the strap. Are there 3 pieces sewn together to make one long strap? If so, do I just sew each piece with a 5/8 seam allowance? 1. It is true to size on my end. I uploaded it and drew it as a standard 8.5″x11″ piece of paper. I cut it out and pin it right to the bag for the dimensions I have listed. On step # 13, you said to “top stitch.” I am assuming this is the bottom of the strap? Also, when you said at the beginning of this step to “clip the point at the top,” I didn’t know what you meant and I cut off the top of the arrow :0( any ideas on how to fix that? Any way you could clarify step # 15 alittle? 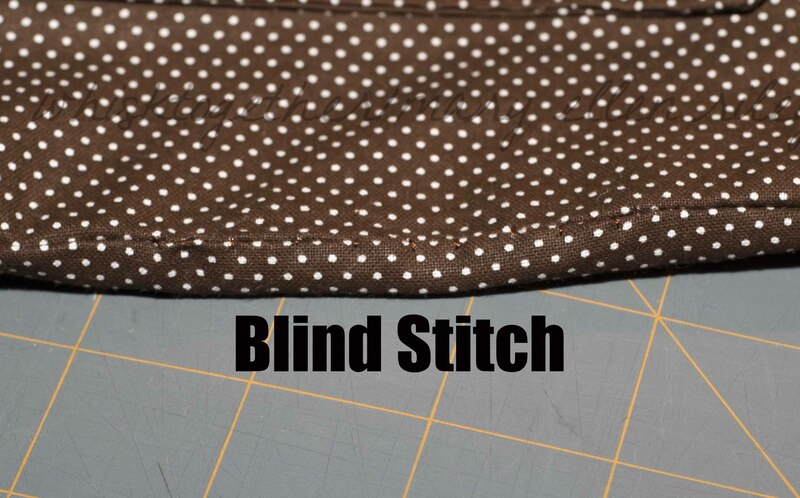 The entire strap is top stitched except for the bottom of the strap (the straight edge) – which will be sewed shut once it is sewn onto the bag. Although maybe not 100% necessary, it gives it stability and a “finished” look. Step 15 is where you put the straps on the bag. So you take 1 strap that has already been turned right side out, and pin it to the side of the bag. The side of the bag will have a very straight edge. 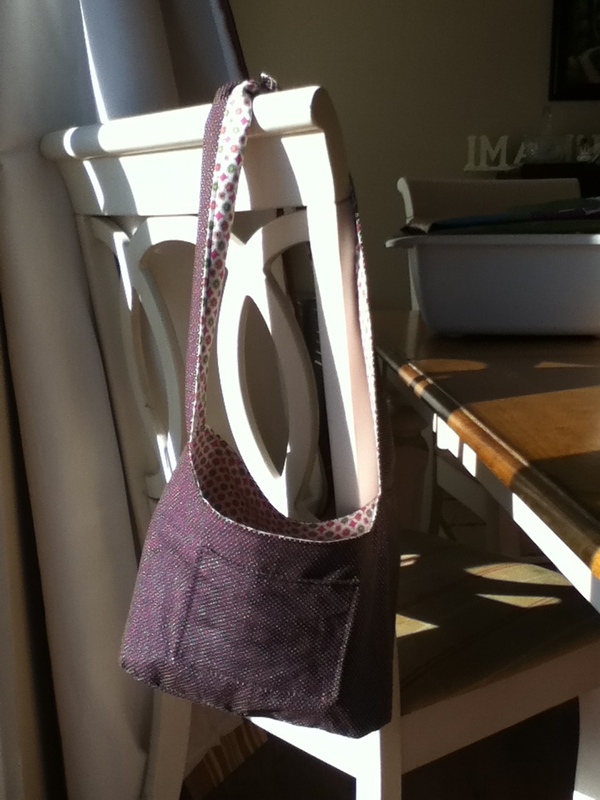 Once pinned, I sewed it to the bag with the straight edge of the strap matching up to the straight edge of the bag. The strap’s point should be pointing down. 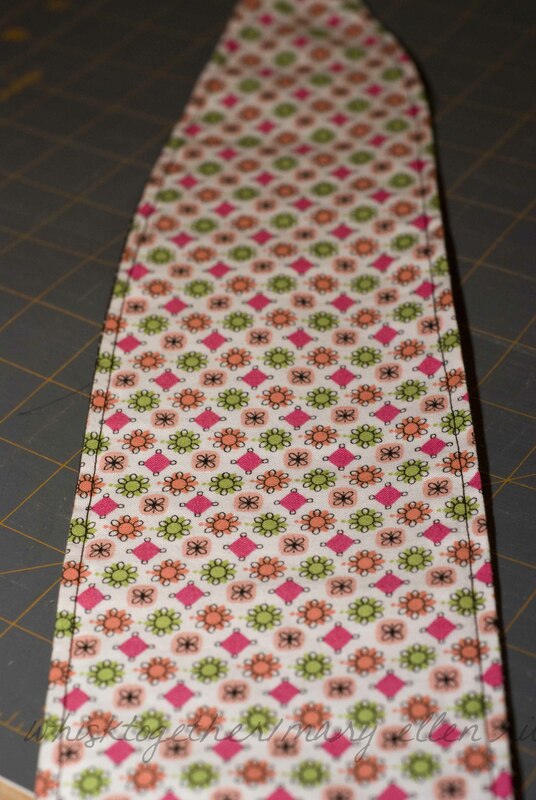 It states to sew within the seam allowance, so I sewed it at 1/4″. I hope that helps. If I can give you any more clarification, please feel free to reply on here. It hits my email account fast! thanks for your help. I also added a duplicate pocked on the inside of the bag. I am a beginner, so we will see how this turns out! It was fun though. Thanks again…. What type of material did you use (ie. quilting weight or décor weight)?? 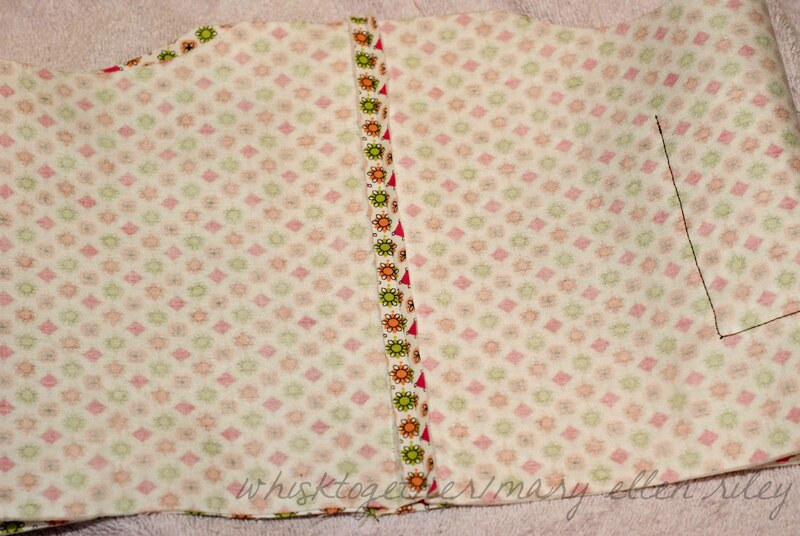 I used the standard quilting cotton material found at Walmart, Joann’s, etc. I believe someone else made this from discarded/old bluejeans and recycled them into a bag. 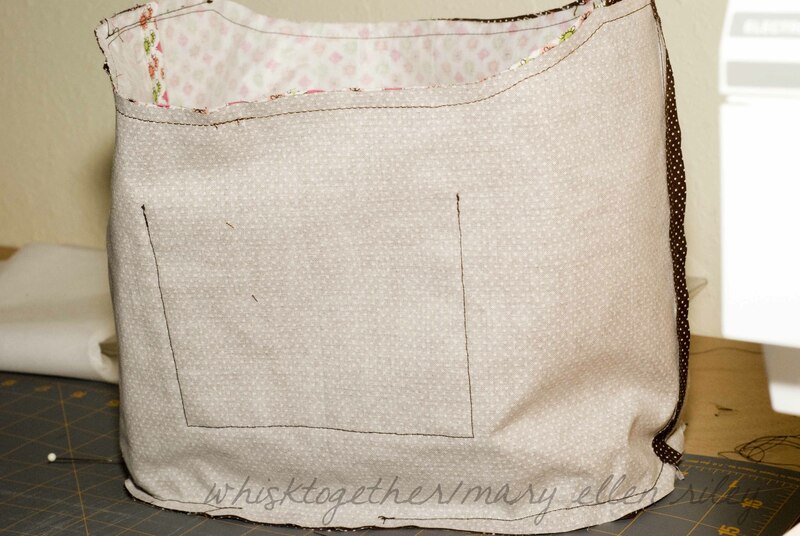 I think either would work and I would love to try this out with outdoor material to make it more waterproof like a typical Thirty One gift bag.